Inflammation of the sheath surrounding the Achilles tendon; pain behind the heel, ankle and lower calf. 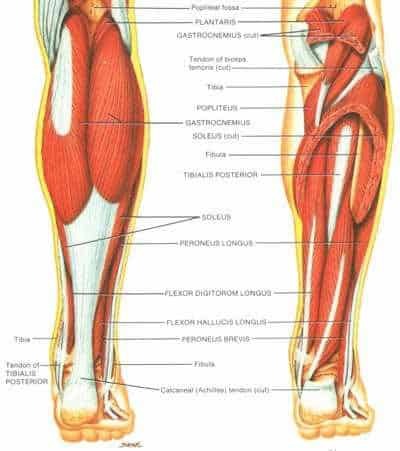 Counter-rotation of the tibia against the femur as a result of excessive pronation causes two heads of the tendon to torque against each other and stretch the tendon. The Achilles tendon is used to plantar flex the foot, or point the foot downward. This allows a person the run, jump and stand on one’s toes. The Achilles tendon is the strongest tendon of the body, and able to withstand a 1000 pound force without tearing. Despite this, the Achilles ruptures more frequently than any other tendon because of the tremendous pressures placed on it during competitive sports. There are two main types of injuries that affect the Achilles tendon; Achillis Tendonitis and Achilles Tendon Rupture. Achilles Tendonitis is simply an inflammation of the tendon, and in most cases is caused by excessive training over an extended period of time. Achilles Tendon Rupture, on the other hand, is a tear (or complete snapping) of the tendon, and usually occurs as the result of a sudden or unexpected force. In the case of a complete rupture, the only treatment available is to place the lower leg in a plaster cast for 6 to 8 weeks, or surgery. There are a number of causes and risk factors associated with Achilles Tendonitis. One of the most common causes is simply a lack of conditioning. If the tendon, and muscles that connect to the tendon, have not been trained or conditioned, this can lead to a weakness that may result in an Achilles injury. Overtraining is also associated with Achilles Tendonitis. Doing too much, too soon places excessive strain on the Achilles tendon and doesn’t allow the tendon enough time to recovery properly. Over time small tears and general degeneration result in a weakening of the tendon, which leads to inflammation and pain. Other causes of Achilles injury include a lack of warming up and stretching. Wearing inadequate footwear, running or training on uneven ground, and simply standing on, or in something you’re not meant to. Biomechanical problems such as high arched feet or flat feet can also lead to Achilles injuries.